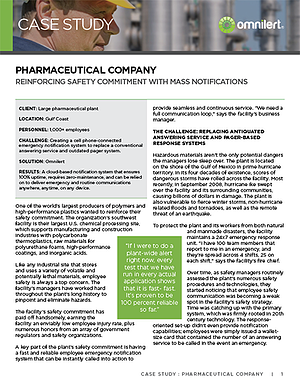 Pha rmaceutical company reinforces safety commitment with mass notifications. Challenge: Creating a cell phone- connected emergency notification system to replace a conventional answering service and outdated pager system. Results: A cloud-based notification system that ensures 100% uptime, requires zero-maintenance, and can be relied on to deliver emergency and routine communications anywhere, anytime, on any device.